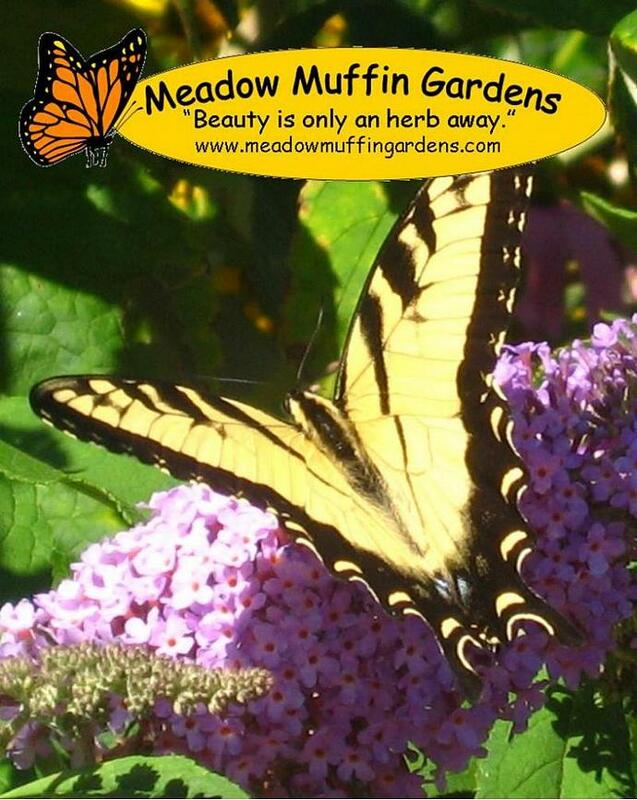 Flower power at its best! 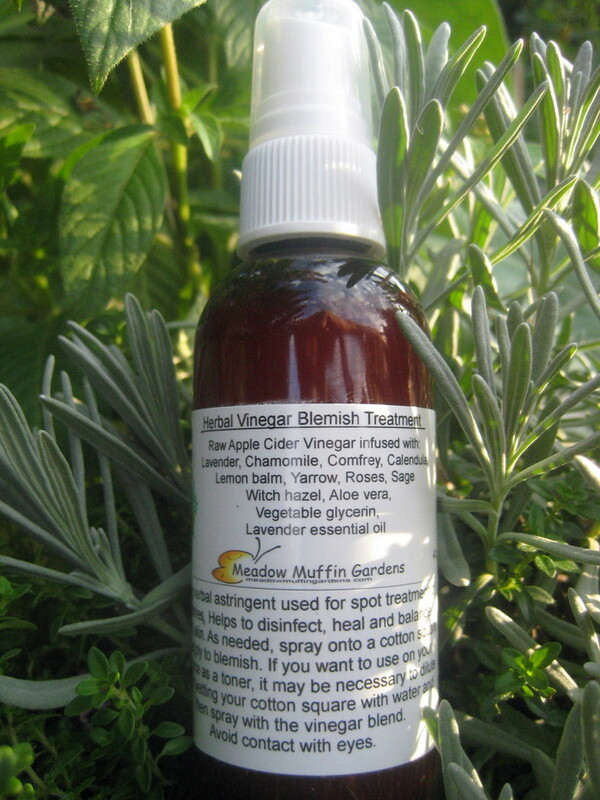 A variety of herbal plants combine to give you a potent herbal vinegar, ideal for drying out those unsightly blemishes. Diet, stress, and life in general often brings on a blemish at the most inconvenient times. Quick action can nip a zit in the bud and hopefully send it packing. Menstrums used for herbal extractions can be an oil, alcohol or vinegar. For facial astringents the one of choice is a good quality vinegar. Whereas alcohol based toners can be drying vinegar restores the natural acidic balance of the skin. 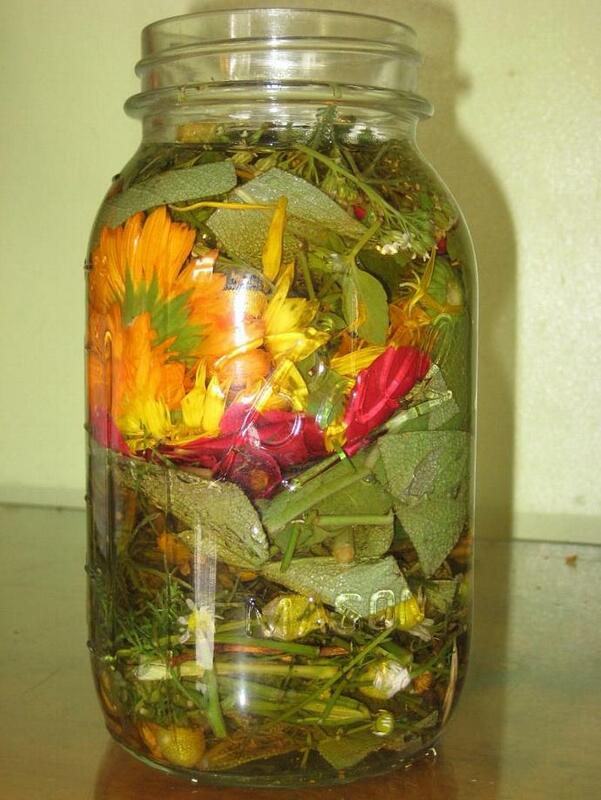 lavender, chamomile, yarrow, comfrey, calendula, lemon balm, rose petals and sage. All are beneficial in many skin care preparations and here you have them in one package! After a six week period the herbs are strained and the resulting vinegar is diluted with witch hazel for its cool soothing action. Lavender essential oil is not only added for its therapeutic properties but for its stimulating while relaxing aroma. You needn't worry about smelling like salad dressing. 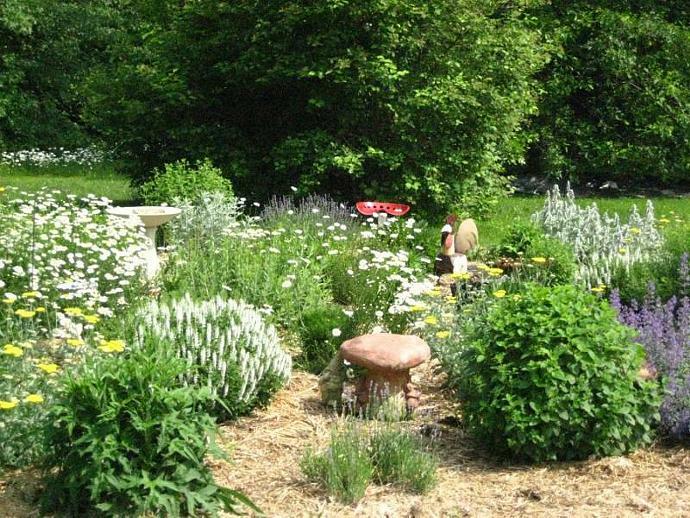 Herbal Vinegar Blemish Treatment is a strong astringent and if using over your entire face as is typical with a toner it should be diluted by wetting a cotton square or tissue before spraying with the vinegar. Watch for sensitivity by applying to a small area first. For spot treatment you spray your cotton square or tissue and apply directly to the blemish. Do not spritz right onto your face. You don't want to get it into your eyes as it will burn. ***A substitution for the witch hazel would be soothing aloe vera gel and hydrating glycerin. Ideal for those sensitive to witch hazel or simply favor the alternative. Please convo me with your preference. Note: Witch Hazel traditionally is made through distillation resulting in a product with 14% alcohol for preservation. Witch Hazel can be made without alcohol but for preservation purposes, benzoic acid, a mild preservative is added. Please let me know upon ordering which type of witch hazel you prefer. Alcohol free is preferred if you want a product for very sensitive skin or are concerned about the toner being too drying. The traditional witch hazel with alcohol is preferred if there is concern with the risk of a preservative causing an allergic reaction. Pregnant or lactating women should check with their physician before using as this toner contains the herbs yarrow and sage. 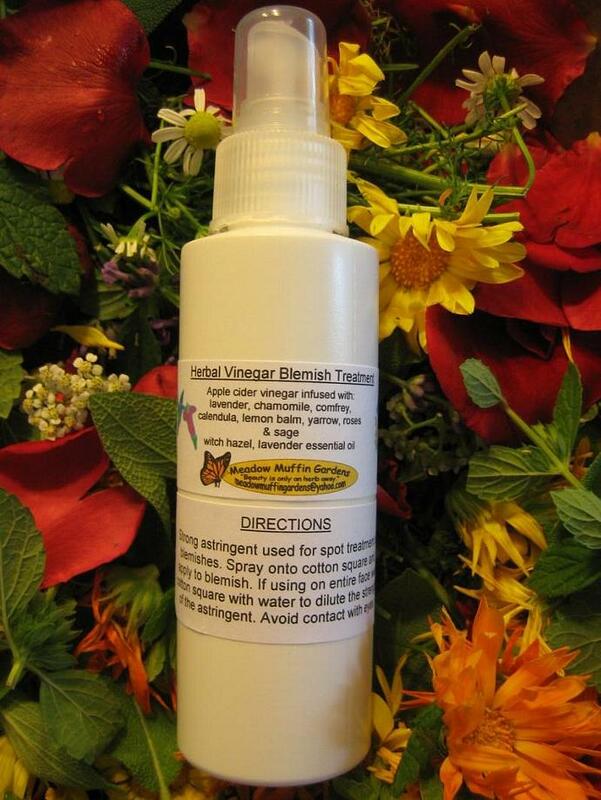 Herbal Vinegar Blemish Treatment comes in a 4 oz. plastic spray bottle. If you have a preference of the bottle please let me know. 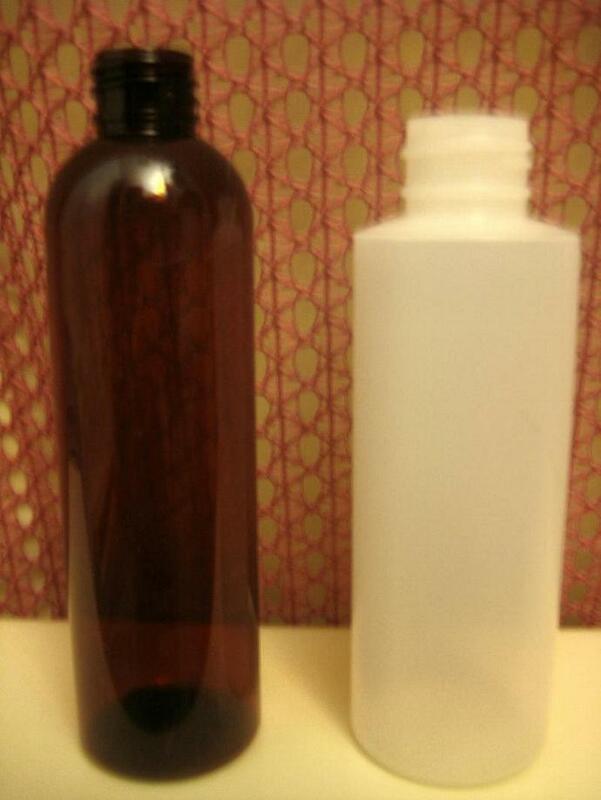 Pictured above are the white or natural #2 HDPE or amber #1 PET plastic, all easily recyclable. "I absolutely love this product! keeps my skin clear..it really does!"